Humans and birds alike will find themselves drawn to the beauty of this stoneware bird feeder. Humans and birds alike will find themselves drawn to the beauty of this handmade, stoneware bird feeder. Birds will flock to the seeds you provide in its sheltered basin, while their featherless friends may be soothed by its mossy green glaze, or by the way its form seems to shift as it turns in the breeze. 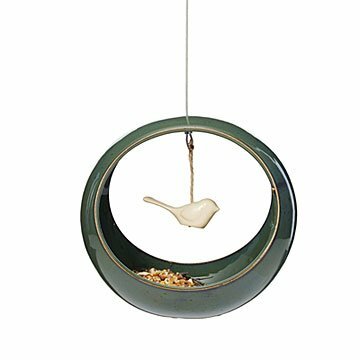 A white bird ornament is suspended inside to keep everyone company, and the all-season piece is suspended from a rust-resistant, coated steel cable. Handmade by Aaron Harrison in Binghamton, New York. The hanging wire is approximately 16 inches long. The Birdie Bird Feeder can hold up to 2 cups of seed and has a drainage hole in the base to keep seeds dry. This feeder was purchased as a condolences gift instead of flowers. It was well received. I bought this as a gift for my aunt. I think it is beautiful and I hope she will think so as well (she hasn't opened it yet)! This is the sweetest little bird feeder ever. I bought it as a gift for my mom and will be ordering more for others.